Escaping Syria To Harvest Hashish In Lebanon : Parallels Syrian migrant workers have been going to Lebanon to work in illegal hashish fields for years. Those who leave areas controlled by ISIS are unsure now if they can ever go home. 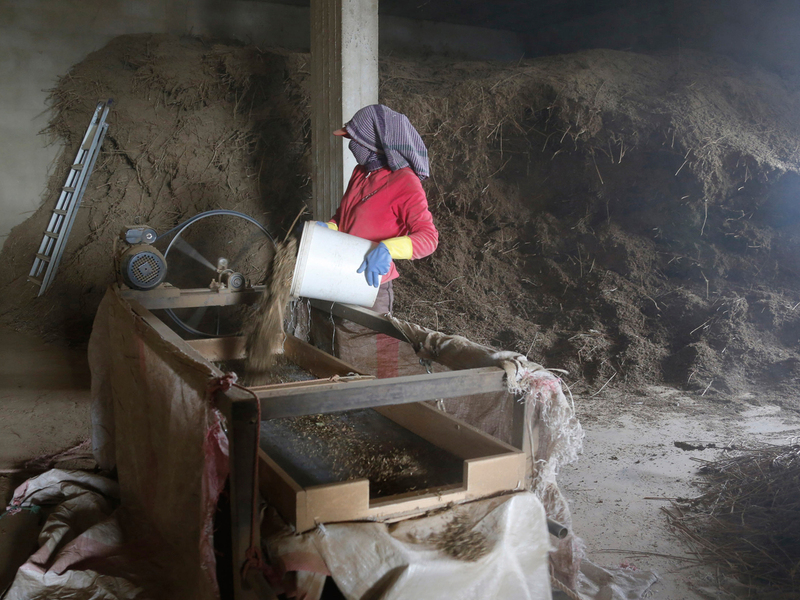 A woman works in a factory processing hashish in Lebanon's Bekaa Valley in December 2014. NPR met her during hashish production time in a dimly lit shed on a winding village street. Inside, the smell of the cannabis derivative was pungent, and clouds of olive-green dust filled the air. Um Muhammad used her nickname, meaning Mother of Mohammed, for fear of what Raqqa's puritanical rulers might do to her family back home if they knew she was working in drugs. Um Mohammed was sifting cannabis buds on a large screen with her 13-year-old nephew. She wore a scarf up to her eyes to keep the sneezes away. 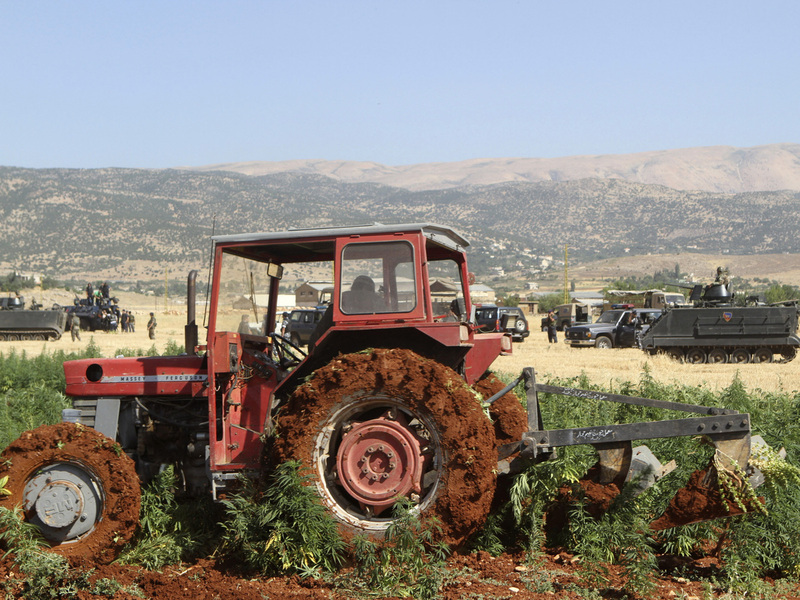 Tractors were used to uproot cannabis plants in Lebanon's Bekaa Valley in July 2012. Farmers forced Lebanese government troops to abandon an operation to destroy their illegal cannabis crop. More recently, production has flourished. She has been coming here as a seasonal worker for years. But this time, she doesn't know if she can go back home. ISIS, under pressure from U.S.-led airstrikes and Kurdish advances, is clamping down on travel. Lebanon has all but closed the borders to seasonal workers. Three months earlier, Um Mohammed left her husband and eldest son in Raqqa, taking her chances on a road that would soon close. It was relatively easy to flee as a woman, with only her youngest child in tow. She is horrified by the strict Islamic rule imposed back home by the Islamic State — if she were to be caught showing her eyes, she says, the punishment would be whipping. But that's not why she left. The family is hurting financially. Her husband, a farmer, can barely make ends meet from their cotton field. In Lebanon, Um Mohammed earns $2 an hour. She saves money by living in a tent and sends her savings back through a network of truck drivers who make the smuggling trek to ISIS-held areas in Syria. Hashish is illegal in Lebanon, so Um Mohammed's Lebanese employer only gives his middle name, Ali. He says the authorities turn a blind eye to vast fields of the crop, which help fuel a multimillion-dollar illicit industry. "The government's too busy to care about weed," he says. "Lebanon has bigger problems," including extremist militants on the border with Syria, a struggling economy — worsened by the war next door — and the weight of 1.3 million Syrian refugees in a country of 4 million citizens. Ali, 25, recalls in years past, hashish was only produced in isolated Lebanese villages like his own. The crop was always at risk of getting burned in police raids. Now cannabis has come back with a vengeance since the start of the Syrian war, flourishing much as it did in the years of Lebanon's civil war, which ended in the early 1990s. "This year, the whole Bekaa Valley was full of hashish," Ali says, grinning. "Not just one area." On a good day, Ali says he can make $10,000 selling his product to clients from Lebanon, Egypt and elsewhere. Business is so good, in fact, that Ali considers a request by Um Mohammed to help the rest of her family immigrate to Lebanon. The road from Syria would be risky, but with a Lebanese citizen as their sponsor, they could cross the border legally and stay. Um Mohammed stays in touch with her husband and older son through voice memos on a smartphone app. She knows her son quit his ISIS-run grade school because he thought it was brainwashing, not education. She shows a photo on her phone of a newlywed relative killed in a Russian airstrike. She wants her loved ones out of Raqqa. It would mean abandoning their property, but she knows that they could make a living in Lebanon farming hashish. And at least they would be safe. Ali says that in his village, the number of refugees and locals is roughly equal in the summer, when many Lebanese families go back to their ancestral village to enjoy the nature. But in the frigid winter months, he says that the Raqqans outnumber the locals. "Maybe they'll kill us," he jokes darkly. Um Mohammed says while some of the Lebanese are kind to her and have come to treat her as a family member in their homes, many others are not. "They call me 'Daeshi'" she says, referring to the Arabic acronym for ISIS, used as derogatory slang. "They say it in public." Black humor is a hallmark of Lebanese-Syrian relations these days, but Um Mohammed says the jabs are serious. "That's how they really think," she says. "I tell them ISIS is more respectful than you!" she jokes. But that's just a comeback. She'd rather have her family here, and safe — even if it means giving up on home.